Privileged place anchored between the ocean and the heart of town. The hotel Windsor Biarritz is above all an ideal location between the Grande Plage of Biarritz and the city center. A privileged place between the ocean and the heart of the city, the Windsor Hotel quickly became one of the leading figures in the Biarritz establishments. The Windsor is today a contemporary establishment, which perpetuates the tradition of 3 generations of hoteliers, the Berdoulay-Heguy family, whose name is intimately linked to the hotel know-how Biarrot. In the Windsor, you will have an unforgettable experience, a discovery of Biarritz and the unique Basque Country, travel between the land and the sea, share the good corners and the unavoidable that only the insiders know. 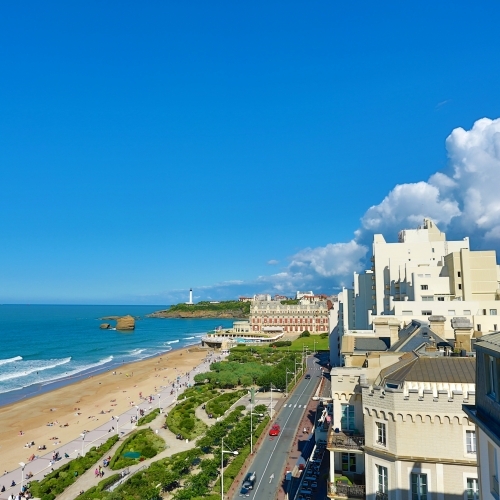 Between intimacy and discretion, the Windsor Biarritz offers you all the modern comfort so that your discovery of Biarritz and the Basque Country is in the measure of your dreams, a unique experience in a unique place.